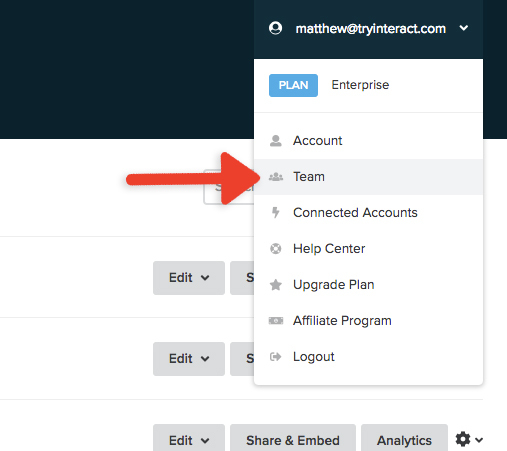 This article describes how to add and remove team members to your Interact account. Note: Adding additional team members is available on Growth and Pro subscription plans. Step 1: Navigate to the Team section of your Interact account by clicking your account email in the top right of the dashboard and clicking on Team in the dropdown menu. Step 2: Click on Add Team Member. Step 3: Enter the email address of the team member you would like to invite and then click Send Invite. Step 4: Once the invitation is successfully sent, the user will be listed in your team as Invite Pending until the user accepts the invitation via the email sent from Interact. Step 5: The team member who you invited will be sent an email requesting the user to accept the invitation to join your Interact team. They will also be provided login credentials they can use to access their new Interact account. Once the invitation is accepted, their status will change from Invite Pending to Active in your team members list. Follow steps 1-4 from the previous section to send an invite to the user you would like to invite to join your Interact team. Step 5: The team member who you invited will be sent an email requesting the user to accept the invitation to join your Interact team. 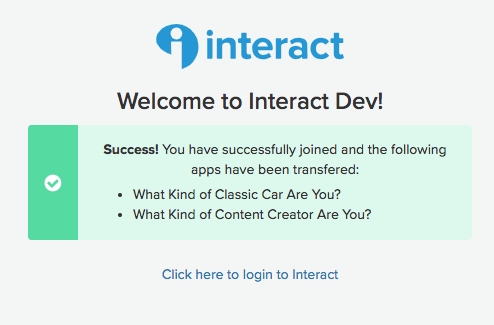 Upon accepting the invitation, they will need to decide what to do with their existing Interact apps. They will have the opportunity to transfer over their existing apps into their new team's account. Interact apps not transferred over, will be removed and deleted. 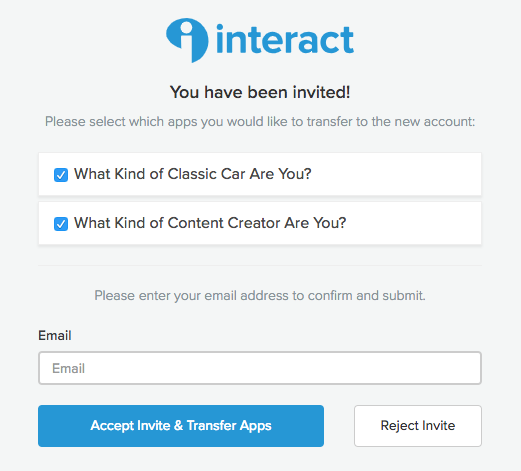 Step 6 (Invited User): Once the Accept Invitation button is clicked from the invitation email, the invited user will need to select which apps to transfer over into the new team's Interact account. Check the apps you want to transfer over from the list of apps. Step 7 (Invited User): Once you have selected all apps to transfer over, type in your email address to confirm, and then click Accept Invite & Transfer Apps. Step 8 (Invited User): You will be shown this success message once you have been added to the team and all apps have been transferred over. To complete the process, you will need to login to your Interact account. Step 2: Find the team member you would like to remove from the list of team members and then click on the trash icon. Step 3: You will be prompted to confirm the deletion of the team member by typing the word DELETE. Then click Confirm Delete to remove the team member's account.